At Acupuncture for Balanced Wellness, we are always looking for natural, non-toxic, and effective ways for people to look and feel great. While some turn to more invasive methods, like Botox, plastic surgery, or chemical fillers, in the quest for beauty, we offer therapies that encourage the body’s natural processes of rejuvenation and healing to promote youthful skin, reduce acne, even out skin tone, reduce hyper-pigmentation, reduce inflammation, and diminish scarring. In this four part series, I will be discussing Facial Rejuvenation Acupuncture, Micro-Needling, LED Light Therapy, and Natural Supplements and Dietary Tips for Anti-Aging. Facial rejuvenation acupuncture has been used for centuries as a natural and effective way to combat aging, enhance beauty, and promote vitality from within. It is the most holistic anti-aging therapy we offer, since we address the body’s constitutional imbalances as well as facial concerns during treatment. As health and vitality are reflected in the face, it’s important to diagnose a patient for imbalances and treat those accordingly when starting facial rejuvenation acupuncture. Both the face and the body are needled with every treatment. During a facial rejuvenation acupuncture treatment, an individual’s facial concerns are assessed and targeted specifically. Common problem areas include crows feet, sagging jowls/neckline, forehead wrinkles, smile lines, and frown lines. To address these concerns, acupuncture needles can be placed strategically to both release muscle tension where needed and tone and tighten muscles that are slacking and causing sagging. For example, tension in forehead muscles due to persistent facial expressions can lead to lines and folds in the brow and forehead area. Strategically inserting needles into specific acupuncture points send messages to the nervous system to encourage the muscles to relax, thus releasing tension and helping to reduce lines and folds. Additionally, a technique called threading, when the acupuncturist inserts very fine needles transversely just under the surface of the skin along a wrinkle, can help to “lift up” the wrinkle and encourage collagen production and blood flow to help soften its appearance. Most often, a combination of deeper needling to affect the underlying structures of the face plus superficial threading to soften surface imperfections is used during a facial acupuncture treatment. While anti-aging is typically the main concern when it comes to facial rejuvenation acupuncture, other concerns such acne, redness in the face, dull skin, and uneven skin tone can also be addressed. These issues often have constitutional root causes (i.e. too much heat in the body can lead to acne and redness in the face), and therefore body acupuncture as well as lifestyle and dietary changes are important parts of the treatment plan. Often, herbal therapy is appropriate as well in these cases. 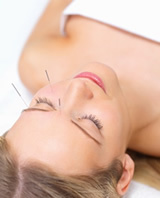 As with all acupuncture treatments, facial rejuvenation acupuncture is tailored to the individual. Most often, a minimum of 10 treatments done once or twice per week is recommended, but some patients may require more or less. Usually, results are noticed around the 5th treatment, but many patients look and feel more refreshed even after a single treatment. Each treatment takes about 1 hour from start to finish, and LED light therapy is typically added with the facial acupuncture to enhance skin rejuvenation effects at no additional cost since no extra time is needed to add it. I will discuss the benefits of LED light therapy in more detail in a later entry. Facial rejuvenation is quickly becoming a more popular anti-aging and skin beautification therapy since it is safe, effective, and unlike invasive or chemical based procedures, provides natural looking results and can actually be beneficial for your health. While there is no downtime when it comes to facial rejuvenation acupuncture, there is some slight risk of bruising or redness after treatment, which is temporary. Most patients find the treatment very relaxing and leave from their treatment feeling rested and refreshed. To schedule an appointment for this treatment at our Chicago office, please contact us.